These two volumes make available work undertaken by a pioneer adult education research group led by John Bestall, formerly deputy director of the Department of Extra–Mural Studies at Sheffield University. The class transcribed or abstracted all the wills and inventories of Chesterfield people among the diocesan records at Lichfield in one of the most successful as well as one of the earliest projects of its kind. The work has been prepared for the press by Dudley Fowkes, formerly county archivist of Staffordshire. 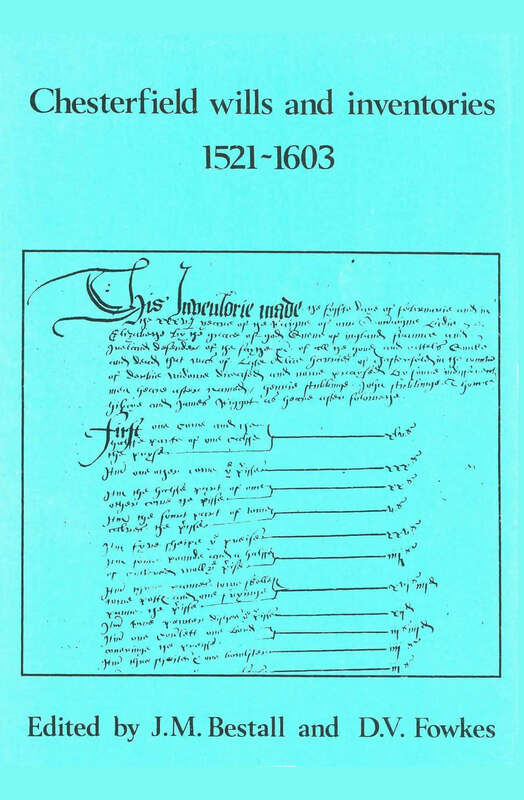 The probate records published in these two volumes throw a wealth of light on life in the main market town of northeast Derbyshire between the early sixteenth century and the mid seventeenth. During the Elizabethan period Chesterfields economy was dominated by tanning, although a number of other crafts were represented in the town. By the Civil War the lead trade was beginning to overtake leather, a process that would continue after 1660. 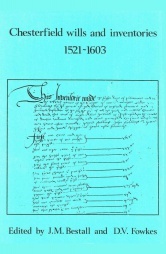 The society hopes at a later date to publish transcripts prepared by the group of Chesterfield wills and inventories proved between 1650 and 1700. An indexed typescript of this volume is available for consultation in Chesterfield Local Studies Library.